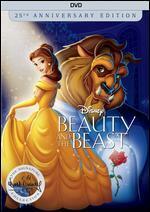 Walt Disney, Leopold Stokowski, Deems Taylor, Philadelphia Symphony Orchestra, Bela Lugosi. Very good in very good packaging. Language: English. Run time: 116 mins. Originally released: 2015. Very good in very good packaging. Language: English. Run time: 116 mins. Originally released: 1940. Leopold Stokowski, The Philadelphia Orchestra, Deems Taylor, Corey Burton, Walt Disney, James MacDonald. Run time: 120 minutes. Originally released: 1942. Tape in LIKE NEW condition; Clamshell Case in Excellent condition. If you have never seen this amazing film, you are in for a treat! 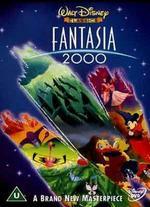 Walt Disney's FANTASIA has been described as "an ambitious anthology of animated fantasies" set to lengthy classical music pieces; it incorporates different experimental forms of animation, often with no narrative. This timeless treasure ranges from mesmerizing, to hilarious, to frightening, but always beautiful. The first piece, Bach's "Toccata and Fugue in D Minor", was used to underscore a series of abstract images. The next selection, Tchaikovsky's "Nutcracker Suite", is performed by dancing wood-sprites, mushrooms, flowers, goldfish, thistles, milkweeds and frost fairies. The Mickey Mouse version of "Sorcerer's Apprentice" is followed by Stravinsky's "Rite of Spring, " a musical representation of the creation of the world, replete with dinosaurs and volcanoes. There is a brief jam session involving the live-action musicians, then Beethoven's "Pastorale Symphony", enacted against a Greek-mythology tapestry by centaurs, unicorns, cupids and a besotted Bacchus. Ponchielli's "Dance of the Hours" is performed by a Corps de Ballet consisting of hippos, ostriches and alligators. The fearsome visualization of Mussorgsky's "Night on Bald Mountain" is dominated by the black god Tchernobog, a fearsome winged demon raging at the heavens (who was referred to in the pencil tests as "Yensid", which is guess-what spelled backwards); this study of the "sacred and profane" segues into a reverent rendition of Schubert's "Ave Maria". FANTASIA remains a one-of-a-kind auditory and visual experience that is still, in many ways, far ahead of its time. Very Good/Very Good. 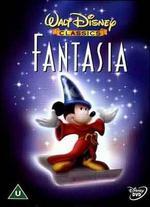 Excellent condition VHS tape in original clamshell case; some light scuffing to the case; Fantasia, Walt Disney's animated masterpiece of the 1940s, grew from a short-subject cartoon picturization of the Paul Dukas musical piece The Sorcerer's Apprentice. Mickey Mouse was starred in this eight-minute effort, while the orchestra was under the direction of Leopold Stokowski. 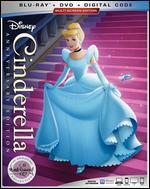 Disney and Stokowski eventually decided that the notion of marrying classical music with animation was too good to confine to a mere short subject; thus the notion was expanded into a two-hour feature, incorporating seven musical selections and a bridging narration by music critic Deems Taylor. The first piece, Bach's "Toccata and Fugue in D Minor", was used to underscore a series of abstract images. The next selection, Tschiakovsky's "Nutcracker Suite", is performed by dancing wood-sprites, mushrooms, flowers, goldfish, thistles, milkweeds and frost fairies. The Mickey Mouse version of "Sorcerer's Apprentice" is next, followed by Stravinsky's "Rite of Spring", which serves as leitmotif for the story of the creation of the world, replete with dinosaurs and volcanoes. After a brief jam session involving the live-action musicians comes Beethoven's "Pastorale Symphony", enacted against a Greek-mythology tapestry by centaurs, unicorns, cupids and a besotted Bacchus. Ponchielli's "Dance of the Hours" is performed by a Corps de Ballet consisting of hippos, ostriches and alligators. The program comes to a conclusion with a fearsome visualization of Mussorgsky's "Night on Bald Mountain", dominated by the black god Tchernobog (referred to in the pencil tests as "Yensid", which is guess-what spelled backwards); this study of the "sacred and profane" segues into a reverent rendition of Schubert's "Ave Maria". Originally, Debussy's "Clair de Lune" was part of the film, but was cut from the final release print; also cut, due to budgetary considerations, was Disney's intention of issuing an annual "update" of Fantasia with new musical highlights and animated sequences. 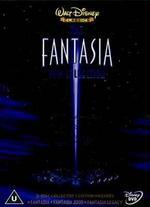 A box-office disappointment upon its first release (due partly to Disney's notion of releasing the film in an early stereophonic-sound process which few theatres could accommodate), Fantasia eventually recouped its cost in its many reissues. 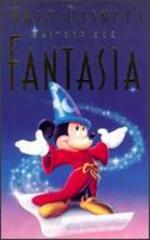 This release of Fantasia lacks parts of the original, making it feel like a watered down version. 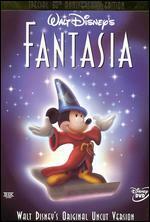 The original Fantasia was seen in theaters in 1942. I saw it then. 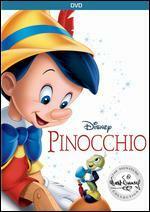 It is still my most memorable movie and I wanted to share it with my grand kids. It brought the same reaction from them. The classical music combined with the imagery of delightful comedy was powerfully entertaining. 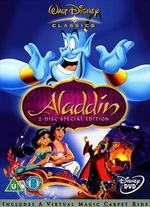 It's definitely a classic Disney, even better than the newer version. Great service from the vendor and the copy was delivered as described.